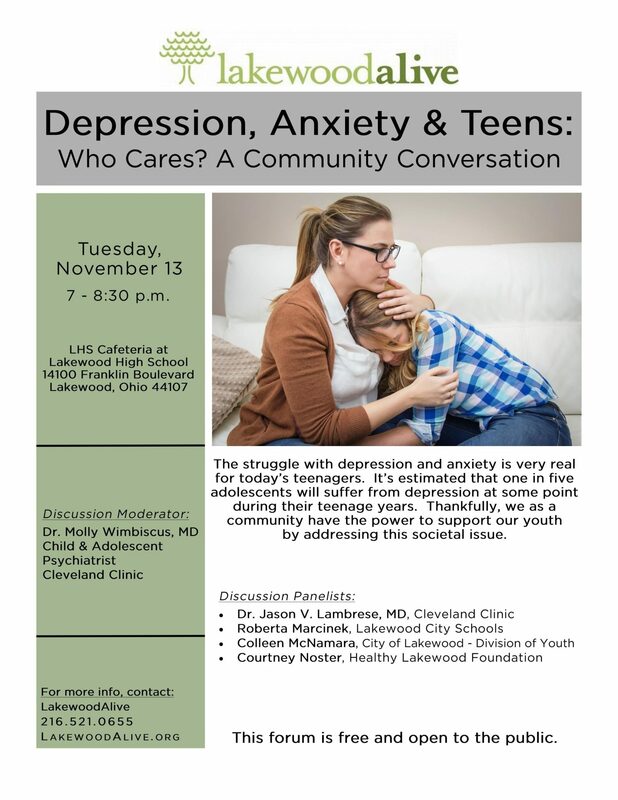 LakewoodAlive, a nonprofit community development organization, announces it will host a community forum – entitled Depression, Anxiety and Teens – Who Cares? A Community Conversation – from 7 to 8:30 p.m. on Tuesday, November 13, in the LHS Cafeteria at Lakewood High School (14100 Franklin Boulevard). This community conversation will offer insightful dialogue regarding how we as Lakewoodites can feel more empowered to support our neighbors, both youths and their parents, who are struggling with depression and/or anxiety. Both the general public and members of the media are invited to attend this free forum as the community seeks to better understand the complexities surrounding teenage mental health while seeking to remove the stigma often attached to depression and anxiety. The discussion will delve into warning signs for which we can monitor, best practices for assisting a young person who is suffering from depression and/or anxiety and the multitude of resources available within our community. Dr. Molly M. Wimbiscus, MD, Child & Adolescent Psychiatrist at Cleveland Clinic, will oversee a distinguished group of panelists for an informative discussion. The final 30 minutes will be devoted to panelists fielding questions from the audience. LakewoodAlive hosts community forums pertaining to topics relevant to Lakewood citizens. For more information regarding the Depression, Anxiety and Teens – Who Cares? A Community Conversation forum on November 13, please visit LakewoodAlive.org/CommunityForums or contact LakewoodAlive at 216-521-0655.